Dolphin attacks on porpoises in Cardigan Bay have left marine scientists scratching their heads. Three out of four attacks by bottlenose dolphins noted in recent weeks by volunteers from New Quay-based Cardigan Bay Marine Wildlife Centre were fatal. Science officer Sarah Perry said such attacks are not unknown but it was rare to see it happening in Cardigan Bay. The centre suggested the attacks may be over competition for food or the result of dolphin mating behaviour. It said scientists have always known that dolphins attack porpoises but the frequency of recent attacks is a real puzzle. In May, volunteers at the centre (CBMWC) in Ceredigion rescued a porpoise that stranded on the beach after being chased by dolphins. Last month researchers saw three dolphins killing a porpoise, with another similar incident a week later. Then last week three dolphins spent 20 minutes attacking a porpoise close to the centre's research vessel Anna Lloyd. They repeatedly pounced on the porpoise, forcing it underwater then throwing it in the air close to the boat. 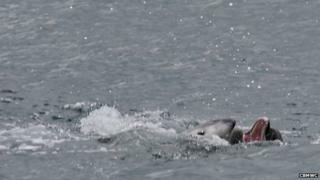 Researcher Milly Metcalfe said: "One of the dolphins in particular was attacking the porpoise while the others joined in from time to time. "Although we were close by, they took no notice of us, intent on the attack." The crew brought the porpoise's body on board and found blood was coming from its mouth, suggesting it may have had punctured lungs or other internal injuries, she said. Ms Perry said the centre had been left baffled by the recent spate of these attacks. She said: "One possibility is that they see the porpoises as competitors for food, especially if there's a shortage of prey in the area. "Although porpoises normally go for smaller prey, dolphins will eat anything. However there's been no other indication recently of any shortage." Another theory is low numbers of females is prompting the attacks by males. Male dolphins have been known to kill young dolphins in order to mate with the calf's mother. Porpoises are similar in size to a dolphin calf. The centre said it is unclear which dolphins have been responsible for the attacks. Mr Perry added: "One animal we're familiar with, Nick, a female, was seen in the area when we rescued the porpoise last month, and she was also seen nearby in last week's attack. "Our records show that she's been seen before with the animals we think were responsible for the attack, so it may even be that she's teaching the others."